sections within Commercial and Residential. Knightsbridge Underground Station on the Piccadilly Line is just a 3 minute walk from our office. Turn left along Brompton Road past Harrods and take the first road on the left – Hans Road. Our offices are on the right hand side at no.14. 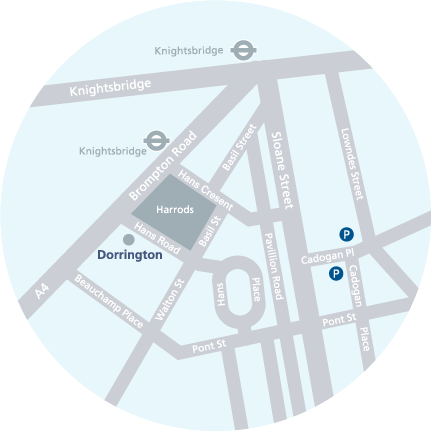 Dorrington's offices are situated off the A4 Brompton Road on Hans Road just before Harrods department store if approaching from the West and just after from the East. You can turn down Hans Road but parking is restricted in the area, so we recommend the car parks in Pavillion Road and Cadogan Place, which are 5 minutes walk.